For the kids polishing their college essays now to meet early admission deadlines, it’s hard to think beyond the next four years. For many young people with college degrees, it’s hard to see homeownership past a mountain of debt. America’s student loan debt has reached $1.3 trillion, surpassing every type of consumer debt except mortgages. We owe more for our college degrees (or our unsuccessful attempts to earn them) than we do in total for our cars. It’s a startling number, with a rumbling freight train of zeroes — $1,260,000,000,000 — equal to more than $3,800 for every person in the United States. That incredible burden weighs most heavily on millennials, though. It’s a lot of money, too. The average student loan balance is well into the five figures — and enough to prompt some millennials to put off life’s milestones. In a 2015 ASA survey of borrowers, 1 in 5 reported postponing marriage because of student debt, while more than half said loans had delayed their decision to buy a home. With the homeownership rate in the United States at a 50-year low, it’s that last finding that has economists and realtors worried. A joint report by the National Association of Realtors and ASA found that 71 percent of student loan borrowers who didn’t own a home cited their college loans as the main prohibitive factor, and more than half said they expect their student debt to delay their home purchase by five years or more. Record high home prices here certainly don’t help either. Student debt and the market aren’t the only reasons millennials put off homeownership; they tend to marry and have kids later in life than prior generations did, for example, and they have seen higher unemployment rates and more sluggish wage growth. “All of that is postponing the entry point of homeownership,” said Lawrence Yun, NAR chief economist. Before we continue: I understand if you’ve got millennial fatigue by now. As a Gen Xer, I certainly do. But there’s good reason to be concerned about the low homeownership rate among young Americans. “First-time buyers cause a chain reaction” in the housing market, Yun said, which creates activity throughout the economy, from moving truck rentals to appliance purchases. “That demand is central to the health of the broader real estate market,” said Jonathan Spader, senior research associate at Harvard’s Joint Center for Housing Studies. People are most likely to form a family and enter the housing market for the first time in their 20s or 30s. And when young adults buy their first home — often a lower-priced starter — it allows an established household to sell. “To the extent that there’s weak demand at the first-time home-buyer level, it prevents existing homeowners from trading up,” Spader said. Student loan debt creates obstacles to homeownership in a few different ways. “The first is the drag on income,” Spader said. “Making a student loan payment every month reduces the amount of income you can save for a down payment.” Indeed, 4 out of 5 millennial non-homeowners in the NAR/ASA survey said student loans were affecting their ability to save up a down payment. Plus, a student loan can make it harder to qualify for a mortgage. Lenders want all of your monthly debt obligations, including your potential mortgage payment, to make up no more than 43 percent of your monthly income. If you already pay 14 percent or more of your income toward a student loan — as 1 in 5 young borrowers did in 2013, according to a Harvard Joint Center study — on top of a car payment or a credit card balance, that doesn’t leave much room for a mortgage. Meanwhile, even if you’re able to lower your monthly student loan bill through one of the federal government’s income-based repayment plans, it might not help your debt-to-income ratio when you apply for a mortgage. “The problem is, most of the lenders don’t recognize those payment amounts,” said Betsy Mayotte, ASA’s director of consumer outreach and compliance. “Those amounts can change year to year if your income goes up,” she said, and lenders don’t like that uncertainty. Unfortunately for loan-burdened millennials, delaying a home purchase over the past few years may have cost them. “We have low first-time buyer participation at a time of rising home values, which means that homeowners are getting housing wealth, but people who are not homeowners are left out,” Yun said. Consider a mid-20s college graduate who felt too encumbered by student loan debt in 2011 to purchase a $300,000 house and decided to wait while she paid down her loans. In the five years since, Greater Boston home values have risen 23.4 percent, according to the Case-Shiller Home Price Index. That same house would now cost her about $370,000. While many experts agree that a college education is still worth its staggering sticker price — degree holders earn higher wages on average and are more likely to own a home in the long run — there are some troubling trends buried under that trillion-dollar school-loan debt pile. One is that more and more students are borrowing thousands of dollars for college but not finishing school. “The people having the hardest time are the ones with debt, no degree, and no job,” Zurick said. 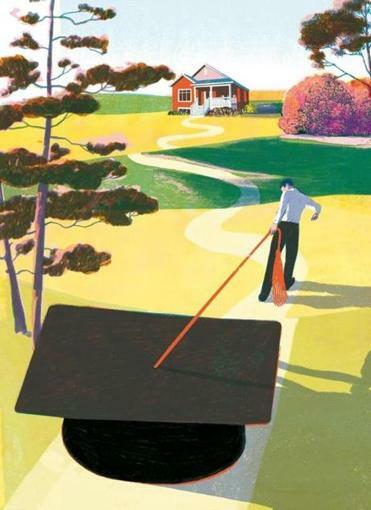 “Without the degree, it’s much harder to get a job that will support your debt.” This one-two punch hits minorities and low-income students particularly hard, as The Boston Globe Magazine reported in May. As you can imagine, borrowers with debt but no degree have an even harder time buying a home. While college graduates are 27 percent more likely to own a home than those with just a high school diploma, according to a study by mortgage agency Fannie Mae, someone with student loan debt but no degree was actually 37 percent less likely to buy a home than that same high school graduate with no student debt. The second big problem on the horizon is that 11.1 percent of student loans are at least 90 days delinquent — more than any other type of consumer debt. “The impact of those defaults on their credit reports could be a barrier to homeownership in the future,” Spader said. Possible remedies to the student loan crisis are out there, both on the presidential campaign trail and in the real world. Some schools are offering money-back guarantees, and more employers are including loan reimbursement as a standard benefit to recruit and retain the brightest workers. But there’s no silver bullet. “The problem’s not just going to go away,” Zurick said — and, like it or not, it affects all of us. Student loans are a burden not just on borrowers, he said, but on their families, employers, and even taxpayers, who are on the hook if they default.